Pure Energy recently supplied a large amount of props for the Lynx Effect Viral Ad. 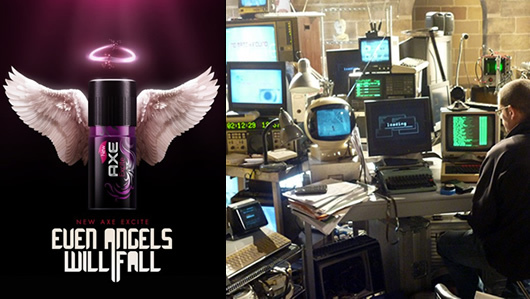 We were tasked with creating a 'Bohemium Angels Control Centre' - a fantasy control room with with retro and modern equipment that the angels might scrounge together to create the head of operations. We used lots of screens, keyboards, control boxes and whatever technical looking items we could find to create the random pile of tech that you see below! The look was directed by the brilliant Anna Sheldrake and we added the technical wizardry that made the set come to life. Several short video animations were supplied and we used these to feed the screens in the various formats required. The older screens were green and amber computer screens that we fed composite video via a video distribution unit. Other newer VGA screens were fed via a VGA splitter box. We even transmitted and low power RF signal to the really old TV's that we used! One of the requirements was to create a fantasy heart beat monitor. We used a retro oscilloscope to create the screen and a Roland MC-202 programmable synthesizer to feed a signal to it. This allowed us to make the screen trace pulse on cue at any speed with a wide range of visual waveforms. It did the job perfectly! The angels needed to be able to video conference to the subject of the scene but rather than have them pretend something was on the screen we set-up a real video conferencing camera so that they could be seen on the screen in real time. This potentially saved a huge amount of time in post production and made for a more natual performance. We needed to be able to start an old dot matrix printer churning out paper on cue. We connected the printer to a laptop and wrote a little bit of software that send data to the printer as and when required. Another part of the film needed the printer to simply form feed a page with markers on it. We did this in a similar way but the paper was pre-printed with the markers. Set Overview Anna Sheldrake and co.